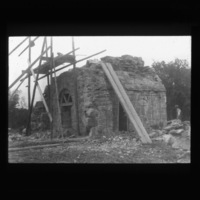 Lantern slide of St Lua's Church, Co. Clare. Originally catalogued as "C3 97", with labels "St Lua's Ch from W." and "Thomas H. Mason, 5-6, Dame St., Dublin, C.I.". Depicts the doorway of church from West. 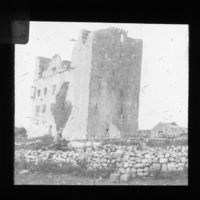 Lantern slide of Lemaneagh Castle ruins (also spelled Leamaneh/Leamanagh) with label "Lemaneagh Co. Clare." Depicts castle ruins in background and two men in the foreground, one on a horse and cart, behind a stone wall. 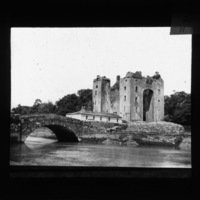 Lantern slide of Bunratty Castle. 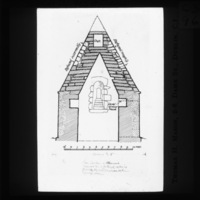 Originally catalogued as "C3 211", with labels "Bunratty" and "Thomas H. Mason, 5-6, Dame St., Dublin, C.I." Depicts Bunratty Castle with bridge and river in foreground. 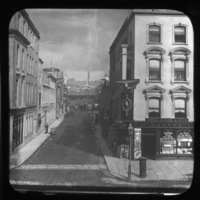 Lantern slide of St. Patrick Street, Co. Cork. 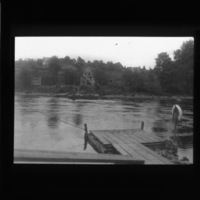 Originally catalouged as "C4 1", with label "Cork." Depicts view of St. Patrick Street, with 'Thomas Cook & Sons' tourist office in the right foreground. 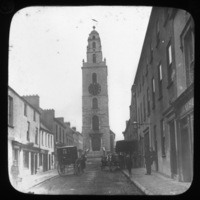 Lantern slide of Shandon's Steeple, Co. Cork. 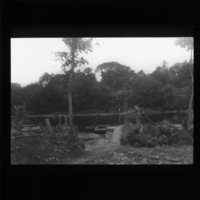 Originally catalouged as "C4 2", with label "Shandon Steeple. Cork." Depicts view of Shandon's Steeple in full height with bronze salmon weather vane, viewed from Church Street. 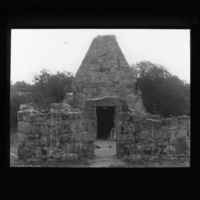 Lantern slide of Shandon's Steeple, Co. Cork. Originally catalouged as "C4 3", with no further label. 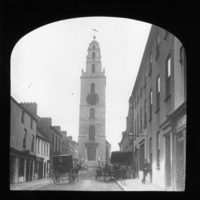 Depicts view of Shandon's Steeple in full height with bronze salmon weather vane, viewed from Church Street.